Disasters involve widespread human, material, economic or environmental impacts, which exceed the ability of the affected community or society to cope using its own resources. Disaster can be natural, man-made or pandemic emergencies. In 2016 globally 315 natural disasters occurred with most of them in Asia-Pacific region. Asia Pacific is highly susceptible to natural disasters due to its geographical structures. China has been experiencing various disasters. In 2017, a bird flu called H7N9 virus has been circulating in China, for which world is not ready to face another pandemic. The rising disasters have been calling for the disaster management actions all over the world. The use of technology has widened to cater the emergency situations such as, use of snake robotics to rescue people from major disasters such as earthquake, flood, landslides and more. Goldstein Research analyst forecast that the global disaster management market size is set to reach USD 135 billion by 2024, growing at a CAGR of 5.4% over the forecast years. The technological advancement in tools and devices used for disaster management, deployment of manpower, number of incidents occurring, enhanced communication system of a region are some of the factors that will induce the growth of disaster management market as per the forecast. 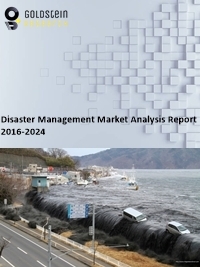 The report covers the present ground scenario and the future growth prospects of the disaster management market for 2016-2024 along with the revenue generated by major players. We calculated the market size and revenue share on the basis of revenue generated from major players across the globe. We have forecast the market on the basis of types of technology being used, regions that experienced disasters, number of major players involved in disaster management, the government spending for disaster management, healthcare support. On the basis of solution, surveillance system segment has the largest market share of 26.2% in 2016 in overall global disaster management market. Surveillance devices are able to detect the possible disaster specially the man-made disasters, as well as in detecting the victims of disasters. Aviation segment grew at a rate of 2.4% in 2016 on account of the support being provided by them during times of emergencies, such providing food and other supplies, manpower support and surveillance of the region. Disaster management market outlook 2016-2024, has been prepared based on an in-depth market analysis from industry experts. The report covers the competitive landscape and current position of major players of disaster management market. The report also includes porter’s five force model, SWOT analysis, company profiling, business strategies of market players and their business models. Global disaster management market report also recognizes value chain analysis to understand the cost differentiation to provide competitive advantage to the existing and new entry players. There is a rising trend of using robots in rescue operations is creating huge employment for the skilled expertise in this industry. These robots are a combination of surveillance devices, IT enabled, communicator which help the rescue team to minimize the search time. With the use of robotics, the disaster management service providers have seen a tremendous growth in developing economies. According to the report, major driving factor for the growth of disaster management market is the government support towards curbing the impact of the disasters or any emergencies. Government agencies are increasing the spending and introducing stringent regulations for the construction industry to minimize the number of casualties during the natural calamities. This leads to spur the growth of disaster management solutions and systems in developing economies. Further, lack of awareness and slow adoption rate of disaster management services in developing economies are the two major challenges for the industry players. Moreover, high cost of infrastructure set-up is creating cynicism among the end-users towards disaster management solutions. Based on geography, Asia-Pacific has the largest market share of 41.2% in 2016 in overall global disaster management market. The highest number of incidents occurring in Asia Pacific region has attracted huge investments from the government as well as from the major players to mitigate the disaster circumstances. Middle East and Central Asia disaster management market has been growing at a rate of 3.8% annually with the growing terrorism incidents as well as natural disasters. Global disaster management market report comprises of the following companies as the key players in the disaster management market: Honeywell International Inc., Siemens AG, Motorola Solutions, Lockheed Martin Corporation, Rockwell Collins, Frequentis AG, Intergraph, ESRI, Metric Stream, Intermedix. What is the revenue of global disaster management market in 2015-16 and what would be the expected demand over the forecasted period?